Highland cattle at Oban’s spring show and sale sold to a top price of 8,000gn. Males averaged £3,536, up £1,721 on last year with a 65% clearance rate. Females were back £32 on the year, averaging £1,365 with an 82% clearance. Topping the sale was Angus Ruadh of Glengorm from the Highland society’s past president Tom Nelson from the Isle of Mull. 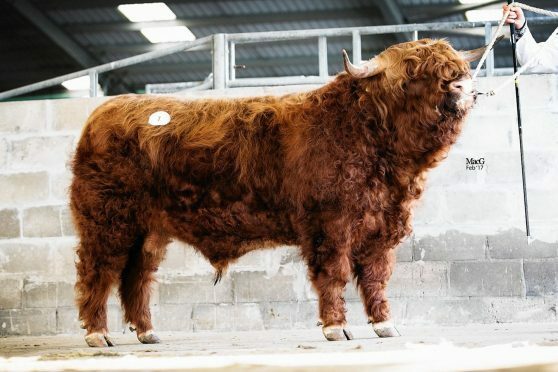 March 2015-born Angus Ruadh was bought by Inverinate Estate in Wester Ross. The fold from Glengorm also took 5,200gn for Archie Sauce of Glengorm who stood second in the same class as Angus Ruadh. Archie Sauce was purchased by Messrs Stewart of Langraw, St Andrews. The overall male champion – winner of the Craig Sellar Trophy and The W Pearson Brown Memorial Trophy for the best two-year-old bull – was a black bull, Cameron Dubh of Kelby. This January-2015 born bull is out of Fiona 2nd of Bien Esk and by Conan Dubh of Craigowmill. Cameron Dubh came from first-time exhibitor T. P. Radford, of Lincolnshire, and went to the Blingery Fold in Wick for 6,500gn. The reserve overall male champion was Douglas of Rannoch, a red bull from Donald MacNaughton who has been coming to Oban for 52 years. Douglas of Rannoch is by Reich of Rannoch and out of Skye 2nd of Rannoch. He sold for 6,000gn and is now on his way to Germany to a new home with breeder Falko Stenberg. 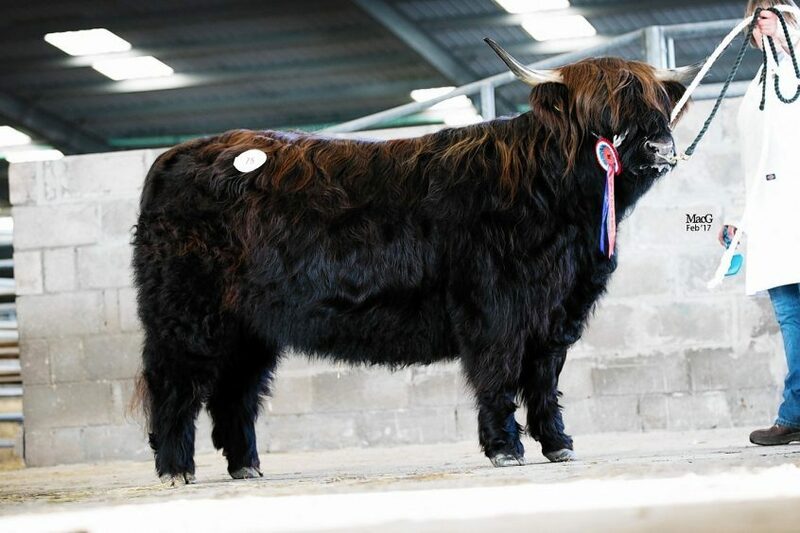 The overall female champion came from Sir William Lithgow, Bt & Son (Ormsary) and sold for 2,200gn. She was April 2013-born Sidonia 12th of Ormsary, by Callum 2nd of Goldenberry out of Sidonia 10th of Ormsary and in-calf to the black bull Ruaridh of Inver. She also heads to Germany to the home of Volker Hahn and Ruediger Lange. The reserve overall female champion was the three-year-old heifer, Amber of Allanfearn, from the Allanfearn Fold of Maureen MacArthur and John Ashton at Strathpeffer. Amber was born in April 2014, is out of Ruby of Allanfearn and by Eilean Dubh of Craigowmill and heads to D. Howden for 3,200gn. Out of the same stable was the two-year-old heifer champion, Skye of Allanfearn who was bought by Hendrick Hoof of Germany for the top female price of the day of 4,000gn. This February-2015 born heifer is by Crusoe of Brue and out of Caileag Bheag 25th of Callachally. Second top female price went to Ken and Eva Brown of the Craigowmill Fold, at Ledlanet, Kinross, with Isla Dubh 9th of Craigowmill who stood second in her class to the overall female champion. She is an April-2013 born heifer by Panther 2nd Vom Aignerhof out of Isla Dhubh of Craigowmill. She was bought by the Blingery Fold from Wick for 3,800gn. This Highland cattle show and sale was the first time a father and daughter judged together. Veteran Jimmy Laing judged the livestock while his daughter, Helen Laing, judged the young handlers classes. Her choice as winner of the under-12 section was Kate Cameron of the Dunach Fold and the senior young handler was Kerrie MacGillivray of the Pennygown Fold, Mull.